…a christianism for sunday…! ladies you could get your "hands" cut off…! So, in the eyes of Yahweh, it’s okay for a man to touch another man’s junk, if it’s for a good cause. But if Israelite Dude # 1 gets into a bar fight with another guy, and is losing… let’s say Dude #2 is about to smash a metal folding chair down on his head, and Dude #1’s wife runs up to help her hubby and grabs Dude #2’s balls, well, guess what? God is not cool with that! …a ancient and draconian Old Bible Testament, changed to a “better” more gracious God of the New Testament Bible not believed by those that wrote “inspired” the Old Testament…! 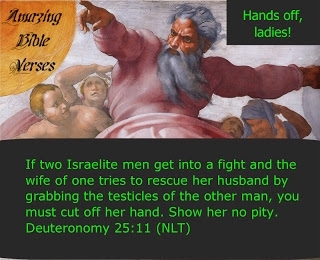 To cut a Woman’s hand off then, is not as bad as orthodox evangelical women not having responsibilities as elders or preaching…! they decide nothing! …Bro. Jesus did not kill by “stoning” the adulteress and the whores…! He said to the Pharisees, he who be without sin, be the first to throw a stone…! I DO NOT KNOW, HOW MANY TIMES JESUS STOPPED “STONING’S”, AND OTHER very grievous penalization’s…! ← …Progress to better things is sometimes "not understood, the why"…? anagrammat sat04-sun05-may2013…!